I wrote a post on how to listen to children reading last year (here), but I've been inspired to write a second post on the subject by a somewhat quirky video on BBC News (here). 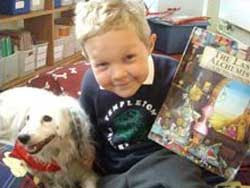 It features a teacher Sarah Ellis who has her class read to her shaggy dog Charlie instead of another student. There is some logic to her creative thinking, dogs won't criticise, the kids can stroke their fur while they read and be relaxed and experience reading as a pleasurable and unstressed experience. Parents have known instinctively that to sit their child on their lap, or to hold them close as books are read together is a positive thing to do. This of course is not so easy in the classroom. So while I'd hope that the joy that comes from books can be the key motivator, and that we could train children and parent helpers to be even better listeners than dogs, I know where she's coming from. There have been many young readers demoralised by the comments of a listener while they are reading, and the stress of performing in front of others. The video story reminded me of an awful experience that I had thirty years ago when teaching children with reading difficulties. I was actually employed by a major education authority in our state as a consultant advising teachers on how to teach literacy. The first day I visited one of my new schools the principal said to me (almost gleefully), "I know just the thing for you to do. Help us with poor Allan. He's in grade 6 but reads like a grade 2 child, we've tried everything with him but nothing works." I accepted the challenge, met Allan and began visiting him on a weekly basis for an hour at a time. I left things for his teacher to do in between my visits. I assessed his reading on my first visit and found that Allan was like a number of children I'd taught, he thought reading was just about decoding. Listening to him reading was a painful process. He laboured over every word. When I assessed his word recognition and knowledge of phonics I found that it was quite reasonable, but when he read out loud he fell apart. I conducted a miscue analysis (see my previous post here) that showed me that Allan relied almost entirely on decoding skills and that he used meaning-based and syntactical strategies much less. Interestingly, the principal and his teacher assumed that his problems were due to poor decoding; and yet, my assessment showed that this was almost his only strategy for reading and that he had sufficient decoding skills. Effective reading requires the well-orchestrated use of all three major strategies, not the over-use of just one. My conclusion was that he was using one strategy, that he hated reading, and that (not surprisingly) he felt a failure at it. PAUSE - After the reader makes a mistake you pause for about 3 seconds and say nothing, this allows time for self-correction. PRAISE - Encourage the reader by praising the fact that he has finished the page, had a go at a difficult word, had no or few errors, read fluently, and seemed to understand what it was about. When this method was used with Allan he made wonderful progress, and after about 6 weeks because we were both proud of his progress, I arranged for Allan to read to the principal. He started reading, and made a basic syntactic error on a word in the first sentence (e.g. 'the' for 'to') which did not change the meaning. The principal corrected him. He made a second error a few words later that again made no difference to the meaning. He corrected him. Within the space of a few sentences Allan was reading just as he had on week one. If only he'd been reading to a shaggy dog! Of course, the main point of this post isn't to argue for more dogs at school. Nor is it to argue that we need to accept imprecise reading; we do want children to read accurately. Allan needed more time to become more confident as a reader. He had made some progress at the effective orchestration of multiple reading strategies and unfortunately he wasn't quite ready for the stress of reading to the principal. But even as an adult, when we are learning anything we don't cope well with being constantly corrected. My point is that the way we listen to children reading matters. Reading is a difficult and unnatural activity that some children find hard. The things we correct, how we do it, the additional comments we make, and how we make them matters a great deal. Here are some basic 'Dos' and 'Don'ts' similar to those I wrote in my first post on this topic. Don't feel that you need to correct every error, or teach every sound that a child seems to struggle with. Listening to a child read is not just an accuracy test. Besides, if the child struggles on more than 5 words on a page then the book is too hard for them (see 'Five Finger Test' in my previous post). 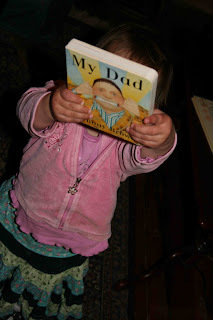 Don't ridicule a child as they read (even your own). Don't make the sessions too long (10-15 minutes is ideal). It's better to have two short sessions each day than one that is too long. DO choose a good time & place - choose a good time when the child is fresh and you are feeling patient and perhaps less stressed. If as a parent it has to be after school give your child something to eat and drink and let them relax or play for a while first. And make sure you choose a quiet place without distractions. DO select books carefully - choose the books well. Hopefully the book will be at the right level, and the child will enjoy it. If the books are boring speak to the child's teacher and try to substitute another book. DO encourage the child and praise them - the purpose of the reading session is to help, encourage and build confidence, not test, frustrate and shatter confidence. DO help them as they read but don't labour any teaching moment. Thank you for this! My daughter just turned 4 and learned how to read seemingly overnight. She loves reading books to us, such as Are You My Mother. I didn't know what or how often I should correct her, especially since she seems to guess at many of the words based on the context and the first letter of the word. I find your blog timely and valuable. Thank you!